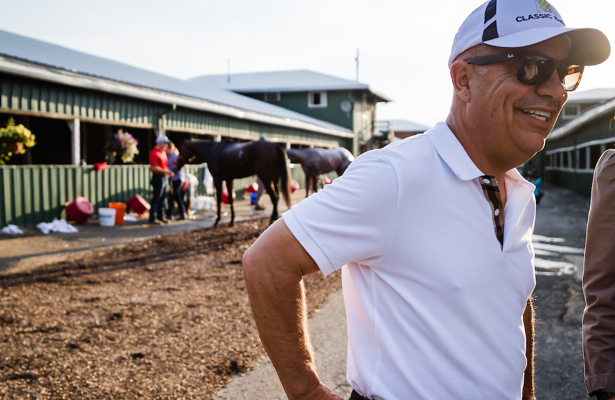 Trainer Mark Casse believes Souper Jackpot to be “one of our better young horses,” and on Wednesday, the son of Ghostzapper finally got a chance to validate that opinion. More than four months after a troubled 11th in his debut at Churchill Downs, the Live Oak Plantation homebred looked like a new horse, re-rallying in the stretch to top a more experienced favorite and break his maiden. That response from Casse came when we asked whether to expect Souper Jackpot to hit the 2019 Kentucky Derby trail. He also noted the colt is a sibling of multiple graded stakes winner Awesome Slew. There were hopes of Awesome Slew, a son of Awesome Again, hitting the Derby trail back in 2015 and into 2016. But that one came down with a near-deadly sickness after two starts. It wasn’t until the spring that he re-appeared, going on to run races such as the Haskell Invitational and Pennsylvania Derby. Awesome Slew’s now a 5-year-old miler, but there’s hope his little half-brother will be comfortable going longer. Souper Jackpot looked beaten Wednesday when odds-on favorite American Mandate caught him and put a head in front in the stretch. Jockey Shaun Bridgmohan guided Souper Jackpot out in the lane, toward his rival, and the colt re-engaged, going on to win by a half-length. Souper Jackpot stopped the clock in 1:10.01 for six furlongs after setting a quick pace, getting the quarter mile in 22.06 and half in 45.67. The gallop out appeared strong, too. The dam of Awesome Slew and Souper Jackpot, Slewfoundmoney, is a Seeking the Gold mare. If it doesn’t come up too quickly, Churchill Downs’ “Stars of Tomorrow II” card highlighting 2-year-olds is one often used for a next step by Casse runners. In addition to the Kentucky Jockey Club Stakes (G2) — a points-paying Derby prep — should be allowance-level races at multiple distances carded for Saturday, Nov. 24.